“Win/win is a frame of mind and heart that constantly seeks mutual benefit in all human interactions. 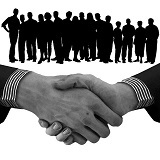 Win/win means that agreements or solutions are mutually beneficial and mutually satisfying. With a win/win solution, all parties feel good about the decision and feel committed to the action plan.” This is about cooperation, not competition. The principle of win/win is based on a strong character ethic. Covey talks about three essential traits that build character. The first is integrity. This is about knowing your deep values and making decisions around those values on a daily basis. The second is maturity, a combination of courage and consideration. It’s the ability to express feelings and opinions with consideration for the thoughts and feelings of others. The third is an abundance mentality, the view that the world is abundant and we can all be equally abundant in it. The opposite would be a “scarcity mentality,” the view that the world isn’t abundant, and if you have more, then I will have less, which results in unhealthy competitive behaviour. The abundance mentality comes from a deep and secure sense of self. It’s about opening up options and possibilities. From the character of integrity, maturity, and abundance comes the ability to build strong relationships, and then from the win/win relationships come the win/win agreements. For win/win to truly work in an organization, there need to be systems and processes that support a win/win, collaborative mentality rather than one that fosters unhealthy competition. Identify and eliminate self-limiting conditioning from the past in order to build strong relationships.